NOTES: Resin kit with photo-etched bits. This is one of those aircraft for which I'll have to quote from the instruction sheet. "The Loening monoplane was a daring innovation in its day, since the field of military aviation in 1918 was dominated entirely by biplane-minded pilots, engineers and procurement personnel. In addition to being a monoplane in a biplane world, the M-8 had other advanced features. One was a radiator installment that was in a tunnel beneath the engine instead of surrounding the propeller shaft or being a separate bolt on item outside the fuselage lines. 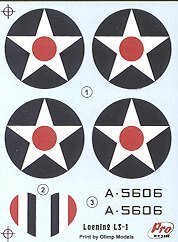 This feature was widely adopted by other high-performance military aircraft in the years to follow." It should also be noted that this aircraft was nearly totally devoid of the usual mass of flying wires so common on aircraft of this age, and that includes later monoplanes. 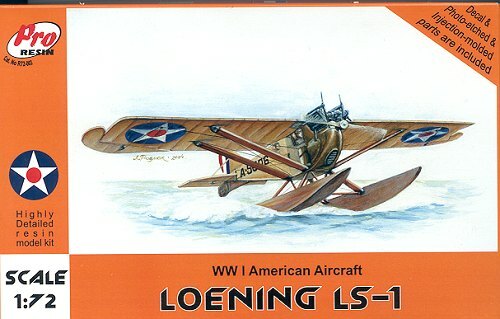 This particular aircraft, the LS-1 was often just referred to as an M-8 as it was basically an M-8-1 on floats. When the Navy ordered 54 M-8-1 aircraft, it stipulated that the planes were to be able to operate off floats as well as the land. That was easily accomplished by simply adding the floats with their struts and an additional fin under the fuselage to help improve water handling. The floats actually look as if they are half completed, but that was the norm back in those early days before hydrodynamics were really studied and more modern-looking floats were developed for aircraft. This is the third of the Loening M-8 type aircraft to be presented in kit form and it is identical in all respects to the previous M-8-1 with the exception that there are floats and their bracings p rovided in place of the wheels. Same great engine and detailed interior. Same etched fret. What will be difficult with this kit is to supply any weight to the nose to keep it from sitting back on the rear of the floats. There just isn't any place to put weight so one will have to resort to cementing it to a base or using a tail brace. The unique parts of the kit are shown above. I should take this opportunity to comment on how nicely the resin is molded and that they use a process similar to what Ultracast does to prevent having to saw away at those huge resin blocks. These parts are raised above the pour stubs and so the actual bits can probably be removed with little more than a sharp hobby knife. A real bonus. The instructions are well done with four well drawn construction steps that also provide any color info that is needed. The aircraft is in an overall Linen shade with the forward section in OD and the wing struts in natural wood. Though there isn't the usual rigging, the controls need rigged and that is shown on the painting diagram. Color info is provided for Humbrol, Revell and Testors paints. The small decal sheet is well printed. Overall a really excellent little resin kit of a fairly unknown aircraft. It is great that ProResin has started up and I note that a P-1 is on the list of upcoming products. I'm all for it!